Notice that the logo on it is the 1987 to 1992 era Siren, which is now found in use in only a handful of stores. 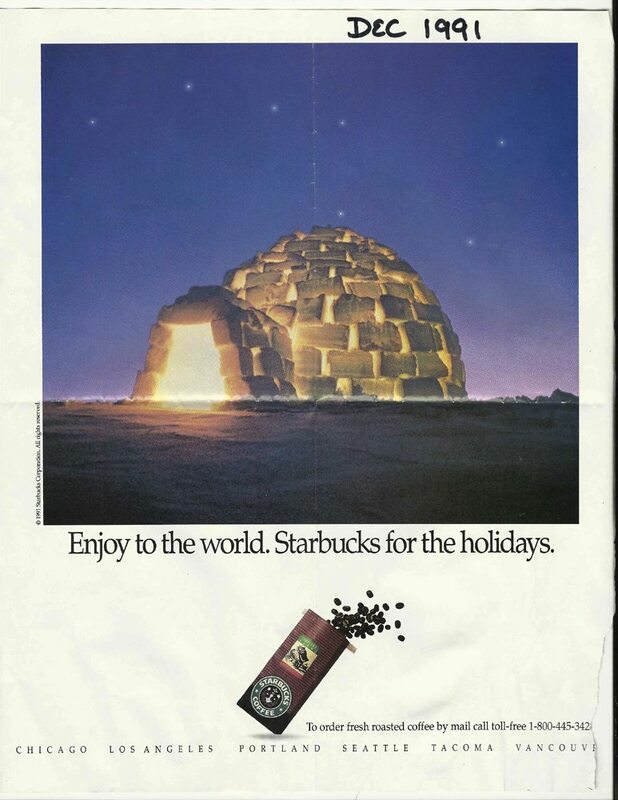 Notice that the advertisement proudly announces that Starbucks can be located in six markets (Vancouver, Seattle, Portland, Chicago, Tacoma and Los Angeles). Notice that this advertisement is for the Starbucks direct mail program, which no longer exists in the same form. One can still order coffee from Starbucks, though nowadays customers do so through StarbucksStore.com. According to the 1992 Annual Shareholder report (page 13), direct mail earnings accounted for about $1,300,000 in net sales by the end of September 1991. Now it’s your turn. We’re having Starbucks history week at the blog given the Joe Magazine and Hear Music blog posts too! I really wanted to share this ad with you, so I hope you like it too! Where were you in 1991? I was only 10 years. 🙂 It’s amazing to see that! Wow a great ad. Hard to see the siren. Quite interesting to notice how SB has grown! Also, interesting to see where the products have gone and where they are now. I would love to hear from customers that went to SB in 1991 to hear how they were treated. Love the history lessons Melody. Was not aware of SB in 1991. I was drinking Cappio (the thrill is the chill!) and was only slightly aware of Starbucks, if at all. All of that changed in 1992 and the start of my Chicago adventure. Thanks for taking me back in time! I ordered coffee for several years through their mail order but it was around 2000. It was how I first discovered Komodo Dragon blend which was one of the best they offer & it was only available via mail order. Now it is in stores everywhere. Hi Sandra! I didn’t realize that they did the direct mail program for that long. I sort of assumed it faded away when StarbucksStore.com was launched, but come to think of it, I think Starbucks first launched a website in about 1999. By the way, Komodo Dragon is still a great blend! 😉 It’s great to hear from someone who did use the mail order program. I love this magazine ad. Very creative. How great to see this. 1991 doesn’t feel so long ago to me, and yet, of course, it’s lifetimes ago. I never paid enough attention back in those yrs in Sbux because I never had any idea how much it would change. I do remember how it was in the stores (Sbux) then, and it was wonderful..all the things it set out to be. It was MUCH simpler, fewer choices…which was good and WAY more about thre COFFEE. I do have a few specific memories of stores from those yrs…like being handed my tumbler of coffee from one of the partners and the lid wasn’t quite on, and it (I) spilled the entire cup of (hot) coffee over my hand and down my white pants I had on for work. The partners were IMMEDIATELY concerned for my safety (I did burn my foot, actually, not badly) They came with cold rags..I felt terrible. I dried off the best I could, got my (truly) ‘refilled’ cup and went on to work. As soon as I got there I changed into some scrubs and sat with an icepack on my foot while I worked. I do remember that from around that time. It was all just ‘simpler’. I took it all for granted and that was my lesson. That magazine ad is adorable! I did have to YouTube the Cappio commercial…but once I saw it, I did vaguely remember it. I wish I could go back in time and see what Starbucks was like back then, since of course there were none in Pittsburgh…which is where I lived until moving to AZ. and yes, komodo dragon is a great blend 🙂 I mixed it at work today in my french press with kenya and those two together is really interesting! In 1991 I was in high school and I’d never heard of Starbucks. I don’t think Starbucks came to Ontario till 1995, but I could be wrong. It’s a pretty ad. Amy – I am interested in this mix of Komodo Dragon and Kenya. You mixed the grounds and then brewed them that way? I am going to try this. I do not really enjoy Komodo Dragon but Kenya is my favourite. I need to apologize because for a few weeks, I was absent from your blog because I just had a million things going on. I need to look back to read about that. Also, I wonder what Starbucks would say if you asked for that in a clover. Everytime I’ve ordered a clover recently, I’ve had a kenya iced coffee (It’s just so perfect). Michelle- It’s in a french press so you just put half one coffee and half the other in it. It really makes for an interesting coffee. I never did that before until recently because I had two pounds of coffee at work- komodo and kenya and someone said, why don’t you combine them? So I tried it once and it was really good. Hi Melody! I stumbled upon this and thought you might find it entertaining. I thought it was pretty awesome! OMG!!! 1991 I was in college!!! Didn’t know Starbucks existed!!! Gasp! I hadn’t met my husband yet or anything like that. Wow! So much has changed.